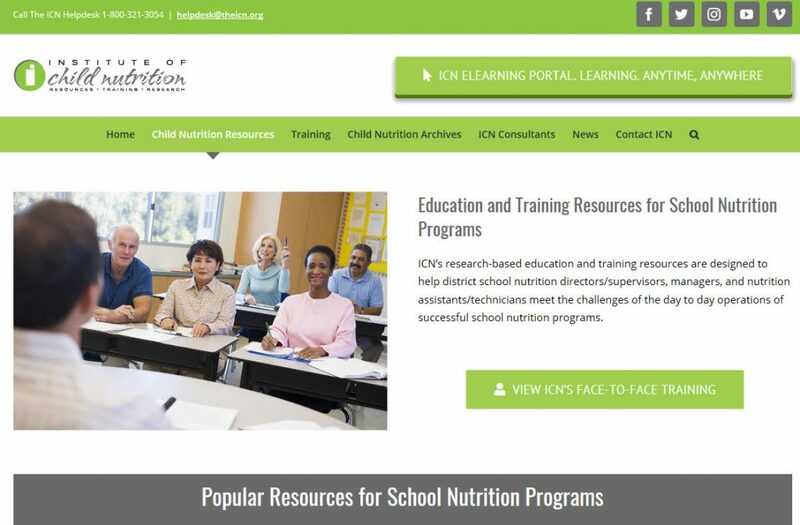 In June 2018, ICN launched a new website to provide easier access to child nutrition resources and information. The new site has a clean design for improved functionality and to enhance the user viewing experience on desktop, tablet, and mobile devices. The improved landing page provides quick access to topic areas such as school nutrition or child and adult care food programs. The Institute’s new website also has a great resource search feature and a new resource index. Users can click on the A-Z resource link from the homepage and find ICN’s most up to date resources in a nice alphabetically arranged page. Digital slides greet visitors at theicn.org with the Institute’s latest news and information. The slides are regularly updated to provide links to new downloads, training events, resources and opportunities. “This is a great way to notify visitors of new resources or events,” Cleary said. Visitors will also see a social media presence on the new ICN website. There are links to the institute’s social channels such as Facebook, Twitter, Instagram and YouTube channels. Users are encouraged to use the social sharing buttons on news stories and other content to post to their own social media pages.